A Machine screw is a fastening device similar to a bolt but having a socket in its head which allows it to be turned with a screwdriver. They are either used with a nut or driven into a tapped hole. They usually have a flat end with no point and a relatively fine thread. They are fully threaded and intended for pre-prepared threaded holes. 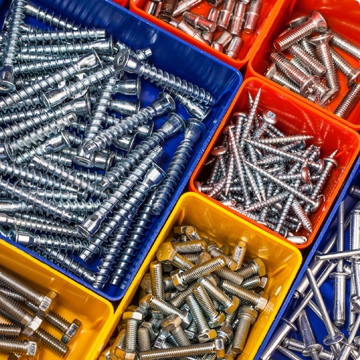 Machine Screws are ideal for holding pieces of machinery together in all types of machines such as Electronics, Engines, and Industrial Manufacturing Equipment. They are also commonly used for fastening machine components, appliances etc. The Pozi Pan Head is used on screw products where a flat bearing surface is required. Intended for use with a Pozi Screwdriver. Made from Grade 4.6 Steel and Bright Zinc Plated finish.